Our website has finally recieved a proper upgrade which we hope all our existing and future customers appreciate. It's now very easy find more information and photos of our products and ordering from our webshop is fast and simple. 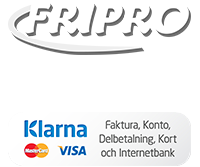 Available payment methods are Paypal (and Klarna if Swedish citizen). Welcome to our new platform, we hope you will like it as much as we do!